L to R: HC Director of Cultural Resources John Sherrer, HC Director of Historic House Museums Fielding Freed, SC Lt. Governor Henry McMaster, HC Director of Marketing & Communications Carrie Phillips, HC Executive Director Robin Waites, and Palmetto Trust for Historic Preservation Executive Director Michael Bedenbaugh. COLUMBIA, S.C. (June 5, 2015)—Lt. Governor Henry McMaster presented Historic Columbia with the 2015 Historic Preservation Heritage Tourism Award during the 2015 Historic Preservation Awards ceremony at the South Carolina Statehouse on Friday, June 5. The S.C. 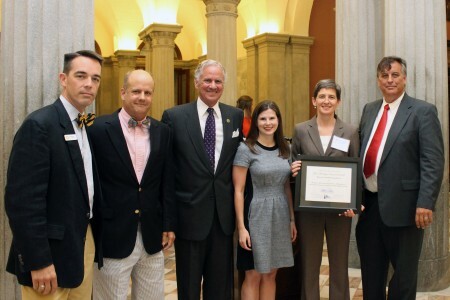 Historic Preservation Heritage Tourism Award recognizes those who best use South Carolina’s cultural and historic resources in the promotion and development of tourism or use tourism to directly benefit the preservation of the state’s heritage. The awards are sponsored by the Palmetto Trust for Historic Preservation, the S.C. Department of Archives & History and the Office of the Governor. Historic Columbia received the Heritage Tourism Award for the reinterpretation of the Woodrow Wilson Family Home: A Museum of Reconstruction in Columbia & Richland County, South Carolina’s only presidential site and the only museum in the United States to focus solely on the Reconstruction era. Closed for nearly nine years, the Wilson home reopened on February 15, 2014 after an unprecedented comprehensive physical rehabilitation and reinterpretation of the content presented in the museum. This project also received an AASLH Leadership in History award this year. During the restoration, Historic Columbia assembled a team of distinguished scholars from the University of South Carolina to create a new interpretive scheme to would showcase the Wilson family in the context of the Reconstruction era, the transformative years when they called Columbia home. The property not only tells the story of the young future president’s life in Columbia; it uses the Wilson family as a springboard to the larger of story of what was happening in South Carolina in the years following the Civil War. Central to that story is the experience of African Americans, considered citizens for the first time in southern history. Visitors to the Woodrow Wilson Family Home are immersed in the context of Columbia in the 1870s as they explore how Columbia’s 9,297 residents, both black and white, navigated the profound political, social and economic changes of Reconstruction. Through panel exhibits, interactive technologies and guided tours, visitors learn that this was a time when African Americans participated in government, founded churches, claimed access to education and negotiated new terms of labor. The Woodrow Wilson Family Home: A Museum of Reconstruction in Columbia & Richland County is open for tours Tuesday – Saturday at 11 a.m., 1 p.m. and 3 p.m., and Sunday at 2 p.m. and 4 p.m. Tour admission can be purchased at the Gift Shop at Robert Mills, 1616 Blanding Street. Tours are $8 for adults, $5 for youth and free for Historic Columbia members. For more information, visit historiccolumbia.org.